Size of Male: 7-12 lbs., 9.5-11.5 in. Size of Female: 7-12 lbs., 9.5-11.5 in. 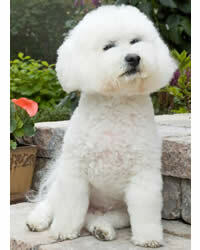 The Bichon Frise is a jolly breed with curly hair. A picture of cuteness and playfulness, these small, hypoallergenic dogs thrive on attention and constant companionship. This “powder puff” pooch may just be the perfect pet for you if you’re the sort of person who wants to give your furry friends a dose of luxurious pampering. The literal meaning of the Bichon Frise name is “curly lap dog.” Just give the dog one look and you’ll see the connection right away. The breed hails from the Tenerife Islands of Spain and later entered France to grace royalty. At the end of the 15th century, during the French Revolution, they changed roles from royal lap dogs to circus dogs. They still exude the airs of a noble pet up to this very day – self-willed, likeable, high-maintenance, and definitely worth flaunting! It’s hard not to get attached to this popular small dog breed. It is playful and delightful to behold. It will follow you around like a clingy little child. Despite its merry nature, this breed can also get annoying at times. You can’t shush it down with one command or one stern look. In fact, it instinctively lets out a high-pitched series of yelps and barks whenever it gets excited or frightened. It loves to make a commotion. If you live in a laid back residential area, ownership of this pooch can make you unpopular with neighbors, especially those who need a lot of peace and quiet. Living Environment – This dog breed cannot withstand humid atmospheres. They have a very low tolerance to heat. This means that when you keep them indoors, your home has to have proper air conditioning. Remember to keep your place sanitized and dust-free as well. The breed is prone to contracting allergies from virtually all sorts of triggers. Grooming – Maintaining this breed entails a full-time commitment. This breed is among dogs that do not shed, but its curly hair needs daily brushing and regular clipping to prevent mats and tangles. You should also allocate a monthly budget for professional grooming services. Every now and then, inspect its ears and coat for possible infections and flea bites. Wipe dry the area around your pet’s eyes. Diet & Exercise – For a breed that tends to get its way by begging, it’s best to hold your ground by limiting food treats to two a day. Always keep a clean bowl of water available to prevent dehydration. However, serve meals that are dry. Sauces tend to upset this pampered breed’s very sensitive stomach. This energetic breed doesn’t impose demanding exercise requirements. It will enjoy doing anything as long as you’re around to watch. Take your pet out on a leash for a walk or engage the jolly powder puff with a chasing game or two, and you’ve made one dog in the world a very happy pet indeed. Health – Even though it is counted among dogs for people with allergies, this breed can be a walking magnet for chronic skin infections and allergies. Careful monitoring is needed as well for possible cases of epilepsy, cataracts, bladder stones and bleeding disorders. Ask around, and 9 times out of 10, trainers will tell you that your Bichon Frise is one of the most challenging dog breeds to train. A majority of the dogs don’t get housebroken at all! The reason has nothing to do with your pet’s mental capability. Rather, it is because most Bichon Frises are independent thinkers. Like their ancient royal masters, the breed doesn?t like to be told what to do. With patience and the irresistible bribe of treats, however, you can succeed with dog training. Trained Bichon Frises have a thing for dog tricks. They can be showoffs and this attitude makes them even more charming than ever. Harley is a Havanese is what I am told. He is amazing and was a rescue pup.